Life as a student at Honoré Mercier is full of opportunities to learn and play! There is always a new adventure waiting just around the corner. 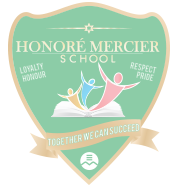 Here you will find out all you need to know about our social and community programs, school library, educational links, and news from the Honoré Mercier community.